From City of Lights to Palaces of Dream. 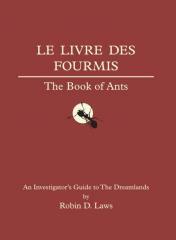 In the style of The Book of the Smoke: The Investigator’s Guide to Occult London, The Book of Ants (a.k.a Le Livre de Fourmis) is the evocative and enigmatic companion book for Dreamhounds of Paris, which gives Trail of Cthulhu Keepers and players an essential window into Paris of the 20s and 30s, and into the Dreamlands beyond. From November 1918 to September 1929, the young poet Henri Salem fell in with the surrealists of Paris. Swept up by the imperious charisma of group leader André Breton, he rapidly found himself sharing cafe tables with the key figures of this most influential and fractious art movement of the pre-war period. According to this, his diary of the era, he traded quips with Marcel Duchamp, feared the madness of Antonin Artaud, and served as model for the famous shot of ants crawling from a hole in a man's hand in Salvador Dalí and Luis Bunuel's scandalous film Un Chien Andalou.